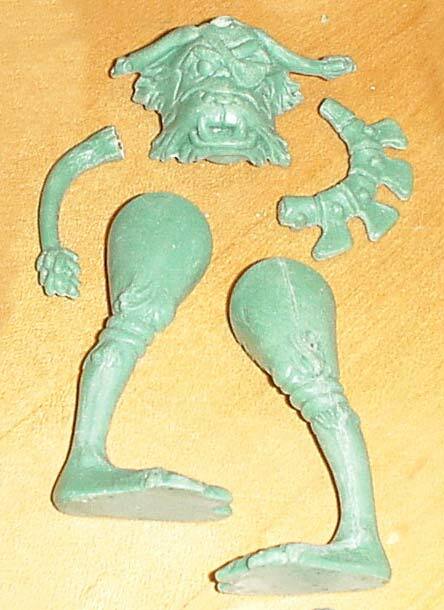 Showcased above is a group of unpainted hardcopy parts for King Gorneesh from Kenner's Ewoks action figure line. Each piece, made of dynacast, was cast using an individual silicone (RTV) mold. King Gorneesh's head ornament is an individual component on the production figure, which explains why the hardcopy head ornament exists as a seperate piece isolated from the rest of the head. A hole drilled into the hardcopy head allows for attachment of the horn via a small metal dowel (not shown).